Several years have passed since Sarkhan Vol altered the fate of Tarkir by saving Ugin from the villainous Nicol Bolas and encasing the ailing Spirit Dragon in a cocoon of stone. 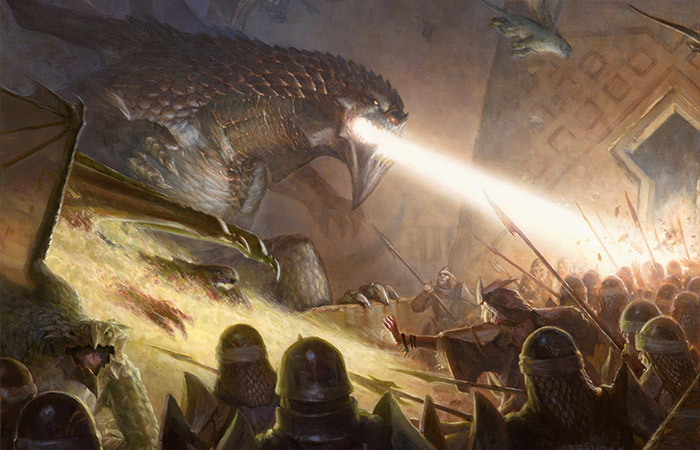 Since then, the dragon tempests that spawn young dragons on Tarkir have not only continued—they have intensified—as though enraged at Ugin's injury. Few on Tarkir know the reason for the storms' fury, but all can see the effects. What was once a delicate balance between clans and dragons is becoming an all-out rout. Every month brings new dragons and new losses. 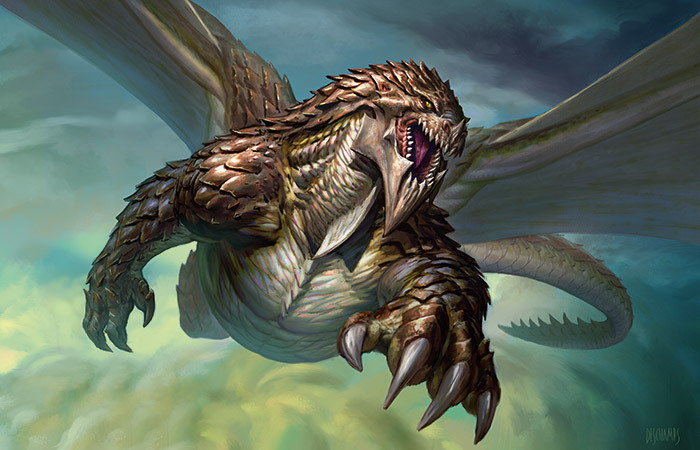 In the Shifting Wastes, the Abzan Houses face off against foes at least as adept at desert survival as they are: the great dragon Dromoka and her brood. 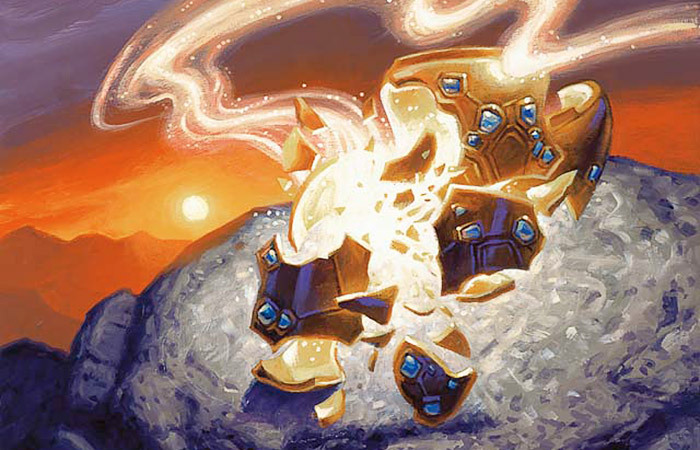 With nowhere to hide, the Abzan have lost more to the dragons' renewed assault than any other clan. Daghatar, khan of the Abzan, must choose his course wisely if his people are to endure. The winds howled over the stone citadel of Mer-Ek, seat of the Abzan khan. The storms had become more frequent over the last year, and there was rarely much of a respite between them. The winds were constant, and in the desert, they were deadly. At their strongest, the winds and sand could flay the flesh from an ibex, or an unprotected person. The fortresses moved less often. Food and water reserves were at their lowest level in the clan's history. But no storm could ever be crisis enough to bring the Abzan elders from the corners of the empire back to their seat of power. Daghatar, khan of the Abzan, sat at the head of a long marble table. It was scratched and scored, stained and worn by the generations of councils that had been held on the spot. Every seat was filled; twenty of the clan's finest and wisest were in attendance, and per the tradition that he had reinstated from Burak Khan, Daghatar did not speak until he had heard the words of each of his advisors in full. He would speak last, and his would be the final words on the matter. Knowing that, his advisors had been talking and arguing for two hours. It was an existential crisis for the clan, and none wanted a decision to be made without the surety that they had been heard in full. Daghatar rested his chin on his hand, weary but attentive, as the battle raged in front of him. "What you suggest is absurd! You speak of Dromoka's brood as if they were force of nature. In the last six months alone, my warriors have brought down three dragons. That's in addition to the two that our khan struck down himself with that mace of his! I'm not talking about whelps, either—the one they called Korolar had a wingspan of twenty yards! Yes, we've had losses, but we can win this fight!" The speaker was Reyhan, joint commander of the forces of three Houses, and the only military leader to achieve any consistent success in the past two years. "Assuming you cowards don't decide to give up on us." She glared around the table. Fewer and fewer people were able to meet her gaze. The man at Daghatar's right began to clap, slowly. "Yes, well done. Well done! And did you hang your trophies across your gates like some Mardu savage? Twenty yards! A mighty victory. Five in six months! An amazing feat. Yet in that time, how many dragons were birthed from the storms?" This was Merel, Daghatar's uncle—a man who refused the khanship himself in his younger days. "My scouts have identified sixteen. And those are just my scouts. Dromoka perches not twenty-five miles from here, and she summons more and more through the storms to her side. She doesn't just command the other dragons' obedience, she commands an army. And I don't think I need to remind anyone of what happened when we faced her directly. Reyhan, you are a master of the war of attrition. My math may be a little rusty, but please, enlighten me as to why you think this could possibly turn in our favor?" Daghatar's frown deepened. 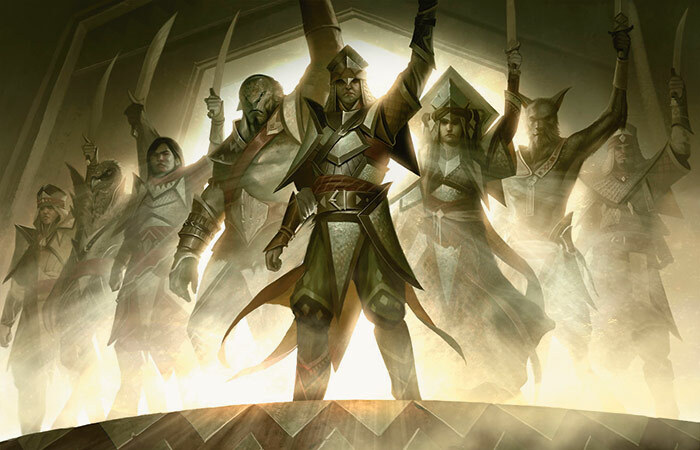 He had held out hope that the Abzan leaders could all come together, and that their collective wisdom would provide a path that he had not already conceived. But instead, they seemed only to confirm his deepest fears. Reyhan glared. "I've heard a lot of criticism out of you, old man, and no solutions. None of you have offered a better plan than resistance. My solution is simple. We pool our remaining forces, and we go straight to the source. We call up all of our fighting men and women, we call up every ancestor willing to listen, and we strike at the brood's heart. We bring down Dromoka, and her brood will scatter. 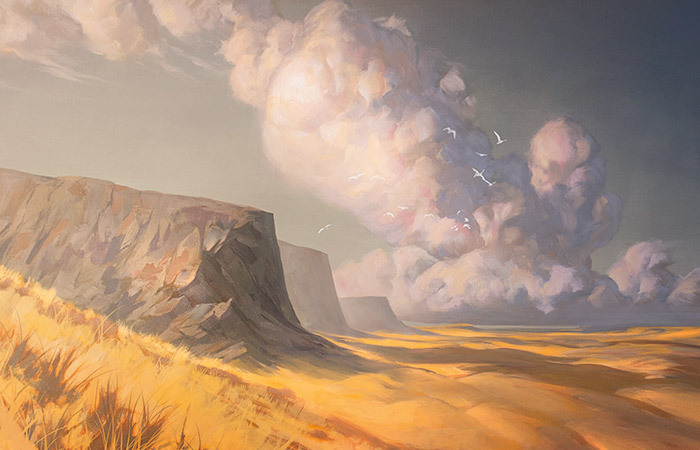 The rest of Tarkir can fend for itself until the storms relent and the winds change. As we have always done." Merel's retort was barely a whisper. His eyes shone with regret. "You weren't there, Reyhan. You didn't see what she did to us. We lost over a thousand soldiers, and we never scratched her. What you advocate is the end of the Abzan." Silence fell over the room. Reyhan's face softened, and she hung her head. "I have heard nothing today that does not lead to that destination, old friend. I'm trying to offer us a fragment of hope, or failing that, an end we can be proud of." Nobody spoke. All that needed to be said had been said, and the truth lay bare on the table before them. Daghatar stood, and everyone straightened in their seats. "I have heard your wise counsel, and I thank each of you for it. On one hand, we have a war we are unlikely to win. On the other, we have a siege we are unlikely to survive. I will not understate this: we may be facing the end of the Abzan. As such, I will not act hastily. The ancestors must be consulted. But whatever is decided, I will be with you until the end. You are dismissed." The khan's chambers were austere. Daghatar was a wealthy man from a powerful family, but none of that was on display in the one space he did not have to share with anyone else. No servants cleaned his room, and no visitors ever saw the inside of it. It was an oddity for a people that prided themselves so much on community, but he was the khan, and he was due his occasional eccentricity. Still, he was not truly alone there. Not with the Remembrance. It watched him enter, and he felt its glare upon him. It was the burden of every khan, going back a dozen generations. It rested in a place of honor, and it was an inspiration to the people that beheld it. Not so to the handful who had borne it. To them, it was a terrifying burden. But in dark times, it was a weapon and a resource like none other. It was said that it came from one of the first kin-trees, bound up with the spirits of some of the very first Abzan, the ones who survived, the ones who learned, the ones who persevered when life itself seemed impossible. These great spirits nurtured that sapling into a mighty, towering tree. Those branches rose higher than the walls of Mer-Ek, higher, it was said, than the far-away spires of the Jeskai, a veritable mountain of wood and bark and leaves, growing, thriving, despite the harshness of the desert. Daghatar often thought it must have been an affront to the heavens, and so the heavens finally brought it low. In the middle of a great storm, lightning struck, shattering the tree to its core. There, they found it. The tree's ancient amber heart, pulsing with the power of the long-dead, merged into a single consciousness. The amber heart was forged into the head of a mace, and it had been carried by the Abzan khans ever since. If he had known what it truly was, Daghatar might have never accepted the title. The amber swirled and pulsed with a fluid light—its movement quickened as it sensed his approach. He reached out for it and hesitated slightly before he gripped the hide-wrapped handle. The voice pounded his mind like a stampeding beast. "Coward. Weakling. You have been avoiding us. Do you fear your duty so much?" Daghatar respectfully lifted the mace and cradled the amber head in his left hand. The elders had not provided the guidance he needed, but the ancestors had never failed him. He sat down, took a deep breath, and tried to keep the weariness and resentment out of his voice. "On the contrary. I fear what might happen if my duty is left undone. But yes, I have been contenting myself with the wise counsel of the living." "The living. Yes. So afraid of what you might lose, you lose sight of what you are responsible for. Your duties are larger than a life, or ten thousand lives. Your duties are to every Abzan who will ever live." Daghatar closed his eyes. "With the way we are headed, that will not be a terribly large number." He felt a wave of contempt from the amber heart. "Only if you fail. Have you already softened to the idea of failure? Will it comfort you as you die, as you reconcile the annihilation that you have consigned your people to, that your road was a hard one?" "I am willing to accept your abuse in return for your advice. There are two options available to us, and neither seems to have much of a chance. Dromoka and her brood are like no other dragons. They are powerful, yes, but they also protect each other. They work in concert, and they are inured to the harshness of the desert. We are at war with a foe that possesses our own strengths in greater quantity than we do. We can do what we have always done, keep our defenses tight, but the dragons are growing in both number and power, and our supplies will not last forever. Or, we can strike at the leader of their brood, and hope that the rest will scatter to other regions. "But I wonder if even that would be enough. 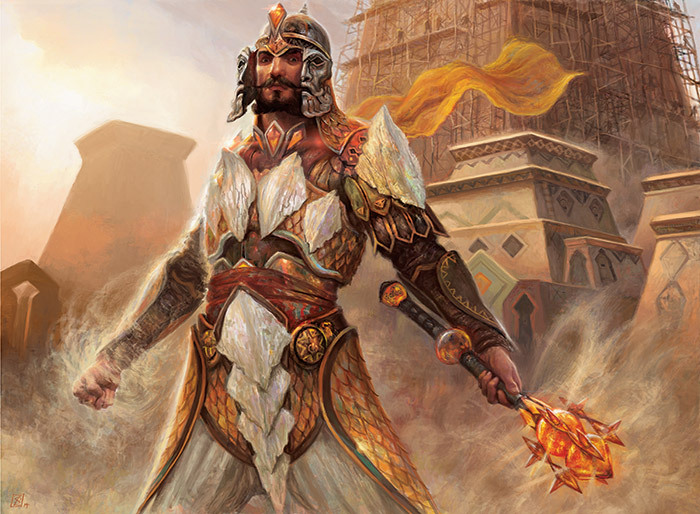 I have heard from some of the other khans, and there is nowhere in Tarkir that has been spared the dragon tempests. We might repel one brood, but another would almost certainly take its place in time. If there is a third option, I have not yet discovered it. So what would you have me do?" There was a brief silence from the Remembrance. "The first crisis you came to me with. Such a trifling matter. You had lost a patrol, it was captured by the Sultai, and you wanted to mount a rescue effort. You wept when I forced the truth upon you, that the hardest thing a khan must do is lose, and survive to win the next battle. You would have lost five times the number in the recovery than you lost to the Sultai. You punished them in the next season, and the spirits of the fallen were brought home again. That is what it means to be Abzan. To suffer a defeat and yet lose none of your strength. You will do this again. The strength of the Abzan is enough to overcome this beast, and no matter how many you lose, you will ensure that there is a future for those who remain. Daghatar Khan, are you prepared to do what must be done?" The khan pondered the words of the Remembrance for a long time. "Yes. I believe I am." The skies were clear, but the wind was strong. 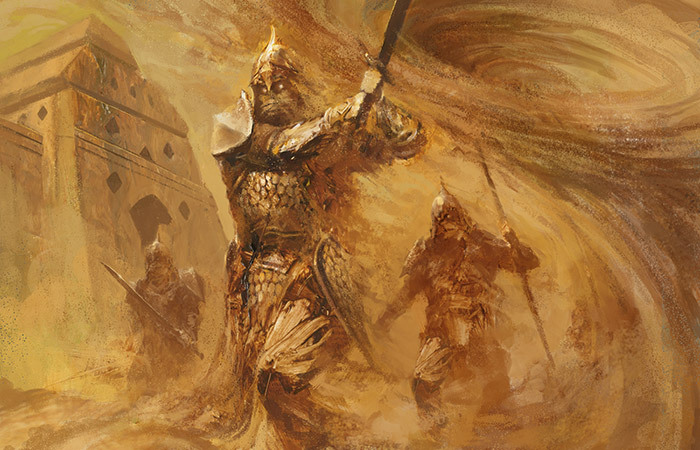 Daghatar's helm echoed with the constant beating of sand against the steel. His mask kept out the worst of it, but he still had to squint as he and his company approached the meeting place. A large outcropping of rocks came into view. Merel's posture changed, but he kept up alongside his nephew—it was the site of the first battle with Dromoka. A thousand Abzan had fallen on these dunes, but time and the desert had washed away any trace of the dead. Still, it was a sacred place; a momentous place. Daghatar could feel it. As they approached, he could see a handful of people waiting for them among the stones. Most of them dressed in Abzan fashion, although they no longer bore the insignia of any house. An instinctive hatred of these men welled up in the khan, but he knew it for what it was. He gripped the Remembrance, and kept marching into the oncoming gale. The stones provided some shelter from the wind, and Daghatar's men loosened their masks and helms enough to take a drink of water. The khan looked at the faces of the envoys, and kept his face a blank. The envoys bowed low, and Daghatar returned the gesture. "Daghatar, khan of the Abzan. On behalf of the Eternal, we welcome you. I am Sohemus." "You welcome me to my own land, Sohemus. Although given the circumstances, I accept. But I'm not here to speak with you. Where is your master?" Sohemus bowed his shaven head low. He had the look of a Jeskai pilgrim about him. "She will be joining us when it suits her. But in the meantime, I will let you know of the protocols that must be followed. When you speak, look at her. She will speak only Draconic, and I will translate. Do not look at or address me in any way." Daghatar cocked his head slightly, then nodded. "Very well. Anything else?" "I wish only to remind you that she has not granted any state of truce for this meeting. Given what she accuses your people of, we make no guarantee of your safety." "What?" Daghatar's heart raced as fury washed over him. "What she accuses us of?" Sohemus bowed low, extending his empty palms. "It is not for me to discuss." Sohemus flinched, and a strange smile crossed his face. "Ah. You will not need to wait any longer. She comes." Daghatar looked to the sky and saw nothing but the blinding light of the sun. Then, the light relented. A giant form descended from above, wings so large that they eclipsed the windstorm. The men below felt pulse after pulse of air forced down from above, as the dragon landed in front of them. Dromoka was enormous, easily three times the size of the largest Ivorytusk Daghatar had ever seen. Her scales were thick, ranging from bronze to pearl, and not a single one seemed to bear a scratch. Thousands of arrows, spears and swords had broken against those scales. Here they were, Daghatar thought, completely unmarred for the effort. The khan stepped out and bowed. The dragon lowered her head slightly in return. She seemed to be studying him, like a person might upon seeing an unfamiliar kind of beetle. The dragon spoke, a rumbling, scraping sound unlike any he had ever heard before. He resisted the instinct to turn toward Sohemus as he translated. "I grant you this audience, Daghatar of the Abzan, although I do not understand what you hope to achieve by it." Daghatar stared up at the dragon. He felt like he was addressing a fortress. "Great and powerful Dromoka. I have come here to seek an end to the hostilities between the Abzan and your brood." The dragon made a sound, a rumble that felt like an earthquake in his chest. It took a moment for Daghatar to realize it was laughter. Sohemus translated what followed. "That will not be possible. Your tribe of necromancers is a stain on her land that she cannot tolerate." "What? Necromancers? I don't understand. You speak of the Sultai, Dromoka. We have never practiced their foul arts." The dragon lowered her enormous head down to look Daghatar almost in the eye. Her expression seemed curious. When she spoke, the heat from her mouth eclipsed the burning sun. "You bind your dead to serve you. Necromancy. You even bring such a dark spirit into her presence, and you look at her and deny it? Yet you seem earnest. Explain this contradiction." Daghatar looked down at the Remembrance. "You misunderstand. These are our honored ancestors. Their wisdom helps guide us. It is tradition, our way. We cannot—"
She cut him off, the Draconic speech a bellow of noise. Sohemus cringed before her outburst, and paused before translating. "The living serve the living, and the dead pass from us. This is the natural way, and…she has strong objections to those who defy it." The dragon continued, in a softer voice. "Dromoka wishes you to know that she has studied your people, and she finds much to respect. You serve one another with courage and are stronger together than apart. You understand sacrifice and strength. Even your tradition of krumar is not unlike what she has instituted among those humans who have pledged ourselves to her. But as long as your people are tainted by necromancy, our brood will continue to wipe yours clean from the desert." Daghatar stared into the eyes of the dragon for a long time. The Remembrance's voice assaulted Daghatar's mind. "Fool. You will not let this opportunity pass you by. You are not here under a banner of truce, and this beast has promised to kill us all. You will never get this close again. Raise me up. Strike your enemy down, now." Daghatar gripped the Remembrance's hilt. He steadied himself, and stepped forward. "Dromoka, our ancestors have guided us for centuries. And I will share with you the truest advice that they have ever given me. They reminded me that a khan's duties are larger than a life, or ten thousand lives. I have a responsibility to the lives of every one of our descendants, until the end of days. That to be Abzan, we must suffer a defeat, and yet lose none of our strength. That we must do what is necessary, even if it is hard. Even if it is unthinkable." He strode up to the dragon, fearless. Dromoka did not flinch, even as he walked up within an arm's length. He could feel the Remembrance, pulsing with power and anticipation. He whispered under his breath as he raised the mace. Daghatar slammed the head of the mace down on the stone beneath his feet. The amber cracked, and the voice of the Remembrance exploded into a thousand screams of agony and rage. He slammed it down again, and again, until it shattered into a thousand shimmering shards. The voice went silent. The ancestors were gone. He released a slow breath, and bent his knee. "Merel. You will take word to every house. Uproot every kin-tree. The practice of necromancy is hereby forbidden." He looked up at Dromoka. "I trust this will be sufficient?" Merel suddenly looked much older. "Son, entire Houses will rebel. You're talking about turning our backs on all our traditions. The destruction of our ancestors! About civil war!" "Yes. But there will be a future for those of us who remain." He looked down at the shards of the Remembrance in silence. As the wind blew, the shards were carried away, shining motes lost to the sand. In just minutes, there was no trace to be found.